As local people have got more conscious about the security of what they belong, insurance companies in Bangladesh are developing. Since promising service of some companies has established the trust, the people of Bangladesh turn to them on and on with optimism. However, if we look back of insurance history in Bangladesh then we see the insurance industry was nationalized and was controlled by two state-owned institutions namely Sadharan Bima Corporation for general insurance and Jiban Bima Corporation for life Insurance soon after liberation in 1971. but, the scenery in entirely changed because there are at present 43 general insurance and 17 life insurance companies operating in the private sector industrial growth. Also, it needs to mention that the company’s business shows satisfactory performance despite tough competition. Besides, as 3 life insurance companies have gone public, their shares are all traded. Because insurance is not a new business in Bangladesh, almost a century back some insurance companies started transacting business during British rule in India both life and general, in Bengal. When 49 insurance companies transacted both life and general insurance schemes insurance companies gained momentum in East Pakistan during 1947-1971. There was the mixed origin of the British, Australian, Indian, West Pakistani and local. Among these companies, 10 had their head offices in East Pakistan, 27 in West Pakistan. Although these were mostly limited liability companies, some of these companies were specialized in dealing in a particular class of business. By the Bangladesh Insurance Order 1972, the government of Bangladesh nationalized insurance industry in 1972. Then save and except postal life insurance and foreign life insurance companies by virtue of this order. Besides, under the five corporations, all 49 insurance companies and organizations transacting insurance business in the country were placed in the public sector. But, a restructuring was made under the Insurance Corporations Act 1973 on 14 May 1973. In place of five corporations, the government formed two – the Sadharan Bima Corporation for general business, and Jiban Bima Corporation for life business following the Act. After that, the current situation comes gradually in this sector. Despite very low Insurance penetration, the contribution of life insurance to the GDP is below 0.5%. The number of customers will increase in this sector if we can overcome the challenges of this industry. Moreover, because we depend on infrastructure to deliver services, infrastructure is another problem. 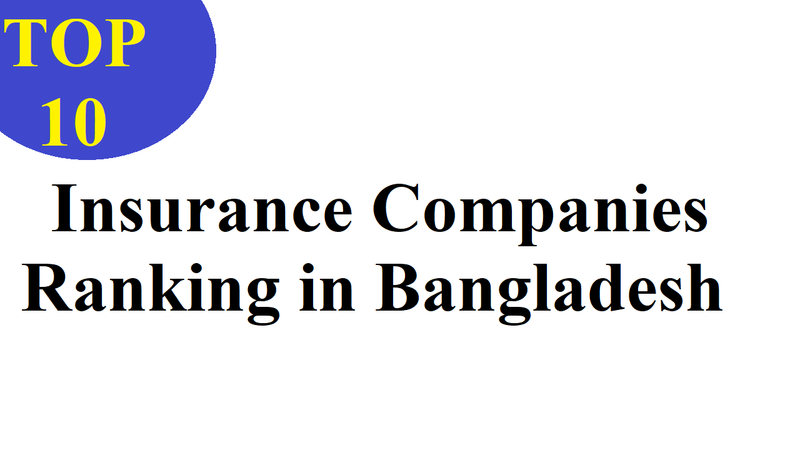 What are the Top 10 Insurance Companies in Bangladesh? According to the Insurance Companies Act, 1913, the insurance company is that any insurer being a company, partnership or association which may be wound up. But, since 2010, the only governing body for regulating and developing the insurance sector of Bangladesh is the Insurance Development and Regulatory Authority of Bangladesh (IDRA). As there are many companies in Bangladesh those who are doing the business, we try to order them in the top ten. From life insurance to car and general insurance, there are almost all types of insurance in Bangladesh. One of the earliest insurance companies in Bangladesh is the American Life Insurance Company. It starts its operation since 1952 in Bangladesh. Although it was an America based insurance company, they have successfully adopted it to suits the needs and expectations of Bangladeshi people. These have taken it at the top position in the country. Its new name is now Metlife Bangladesh. As one of the States owned Bima Corporation in Bangladesh, Jiban Bima Corporation, it has branches all over the country in Bangladesh. The term ‘Jiban Bima’ has taken from the Bengali language that means Life Insurance. And many people of Bangladesh prefer to buy policies from Jiabn Bima as it’s a government organization. Among the private insurance company in Bangladesh, Delta Life Insurance is the first one and working since 1984. Also, it’s the largest private insurance company in Bangladesh that has broadened its range of works to abroad. And the company is founded for serving the nation in insurance service that it can work all over the country. National Life Insurance is one of the largest insurance companies in Bangladesh, which has spread across the country. To reach the entire insurable person in Bangladesh, this unique insurance company started its journey. Apart from these, they are successful also with their direct beneficial schemes and other offerings. By their ‘Micro Insurance’ segment, the Shandhani Life Insurance Company is creating a change in the society. As the insurance company has been working for 25 years in Bangladesh it focuses on the poor people and low-income people also for purchasing insurance and they provide smaller insurance and low-cost insurance. This is because very soon it was able to get lots of the customers of Bangladesh. After establishing in 1996, the Meghna Life Insurance is providing the right price with the modern facilities. This is one of the largest insurance companies in Bangladesh. As Bangladesh is an Islamic country, most of the people of this country are Muslims on focusing this Takaful Islami Insurance started their journey. Also, they have many schemes, which are based on Islamic rules. Since the company works in both sectors Life and Non-Life insurance, it has successfully created a large network all over the country. Although the Padma Life Insurance Company is also an Islamic Insurance company in Bangladesh, their plans are designed keeping security as well as growth aspects in mind. Sunlife Insurance has started its journey by focusing on customer security and benefits from 2000. And it’s working across Bangladesh with success. This is one of the popular insurance companies in Bangladesh.